When Shana Brown was in 11th grade, her US history teacher took a metal wastebasket, flipped it upside down, and started banging on it like a drum. “Go, my son, get an education! Go, my son, get off the reservation,” he sang. Brown had grown up on the Yakama Indian Reservation, but went to public school nearby. “Yeah,” she says, letting several seconds pass after telling that story. We’re sitting at a cafeteria table on one of the basketball courts of the Chief Leschi School, a cluster of buildings set among fields of plump Puyallup Valley strawberries, raspberries, and rhubarb. A warm breeze drifts in from a propped-open door in the back. President Barack Obama is threatening to veto a Republican-drafted appropriations bill that cuts funding for Indian programs and includes other questionable Indian policy riders.H.R.2822 provides $2.5 billion for the Bureau of Indian Affairs. That’s $159 million, or 5 percent, less than the $2.7 billion that Obama requested in his fiscal year 2016 budget for the Department of the Interior. “This funding level would limit DOI’s ability to make key investments in education and wrap-around services to support Native youth, eliminating all increases to post-secondary scholarships and $10 million for education program enhancement funds to allow Bureau of Indian Education to drive school improvement and reforms,” the White House Office of Management and Budget said in a statement of administration policy on H.R.2822. The Senate Committee on Indian Affairs will hold an oversight hearing next week on youth suicide. According to the White House Native Youth Report, suicide is the second-leading cause of death for American Indians and Alaska Natives ages 15 through 24. Their rate of suicide is 2.5 times higher than the national average. The problem is particularly acute for young Native males. According to the report, their rate of suicide was by far the highest among all Americans ages 15 to 24. The Indian Health Service, through the Methamphetamine and Suicide Prevention Initiative and the Suicide Prevention Program, offers funding and support to help tribes address the issue. The Substance Abuse and Mental Health Services Administration also provides grants and programs in Indian Country. But the White House report urges the federal government to do more to protect the youngest and most vulnerable Americans. The hearing takes place at 2:15pm on June 24 in Room 628 of the Dirksen Senate Office Building. A witness list hasn’t been posted online. To see more links or read the article on Indianz.com. click here. Before he even considered going to college, Byron Tsabetsaye ruled it out. While attending high school on the Navajo Nation, Tsabetsaye didn’t know anything about college applications, financial aid or selecting a major. An average student, Tsabetsaye said his teachers didn’t expect him to go to college, so he didn’t either. Yet Tsabetsaye, the son of a homemaker and a Navajo Housing Authority employee, was destined for something greater. He was poised to become a first-generation college graduate, but he didn’t know where to start. Then a friend introduced him to Fort Lewis College in Durango, Colorado. Fort Lewis awards more bachelor’s degrees to Natives than any other college or university in the United States. Only one other institution, the University of Minnesota, Morris, offers free tuition to Native students. Tsabetsaye enrolled and excelled. He served as student body president before graduating with a Bachelor of Arts degree in English in 2013. He finished a Master of Arts degree in higher education and student affairs this spring at New York University, but he attributes his success to Fort Lewis. Fort Lewis offers bachelor’s degrees in 30 disciplines, including programs in science, technology and math, and it boasts more than 80 registered student organizations. With 162 tribes represented—including several from Alaska—it’s in the running for most diverse campus in the nation. But this small liberal arts college perched atop a hill overlooking Durango is becoming a source of controversy for Colorado as the annual tuition tab increases. More than 1,100 Native students enrolled last year, comprising 30 percent of the total student population—and placing an unprecedented financial strain on the state. Colorado last year paid 6 million in tuition for Native students at Fort Lewis, with 5 million of that for out-of-state students. The growing bill pits a century-old charter against contemporary questions of who should foot the bill. 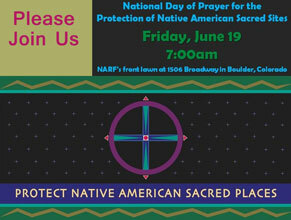 For our friends in the Colorado region, please join us this Friday, June 19, for a sunrise ceremony that will be held at 7:00 a.m. on the front lawn of the Native American Rights Fund at 1506 Broadway in Boulder, Colorado. The program and prayer service will last about one hour, followed by a potluck breakfast. Speakers will include Kiowa elder, Andy Cozad, and NARF attorneys involved in sacred places work. Speakers will be followed by a moment of silence in honor of the many sacred places that are being threatened, damaged, and destroyed today.